Aldi vs. | Aldi. Is it worth it? Come here and see! Aldi. Is it worth it? Come here and see! This stuff is the best yogurt I’ve ever bought. Creamy, tart but not abrasive, thick but not pasty, and a perfect addition to a summer peach crisp. We like to do organic dairy when we can, and I rarely get to have organic Greek yogurt from Aldi, so I’d say I’m quite pleased with being able to have it this morning! …but there are worse problems than full and happy bellies. Enjoy, and remember your quarter! I don’t know how many people read this blog, but I know I get visitors, so I value you for being here even as I’ve been getting back into the swing of things after having my 3rd baby! Tips and tricks of the Aldi trade? I appreciate everyone stopping by even when I’ve struggled to keep up with this. Living far (35+ minutes) from an Aldi has been tricky in respect to this blog. But helping people get good food at good prices is exciting for me and helpful to you, so I want to do be there for you all in a way that is consistent and valuable. Are the items from Aldi worth the savings? My answer: usually yes, but I’m here to help you figure out if those savings are worth it to you. Do you want something festive for Xmas? Do you have restrictions on alcoholic beverage drinking like me? Do you want ginger in every application possible? And do you live an inordinate distance from a Trader Joe’s? Well, if any of these questions have you answering “yes,” see if your pre-celebration Aldi run can include some Sparkling Ginger Brew. 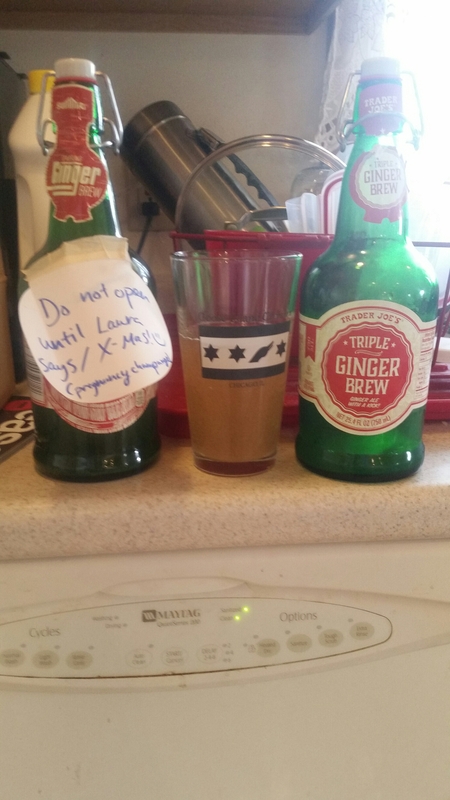 Since I’ve been saving this for Xmas time, I only got started a couple weeks ago with the Triple Ginger Brew from Trader Joe’s (which I got over Thanksgiving when in my mom’s more metropolitan neck of the woods). It was my son’s birthday and I thought that I should get the tasting started! Unfortunately I was the only one who wanted any, so the tasting was more of a marathon than a sprint. Fast forward to 2 days before Christmas (yoday), and that same boy who turned 2 just a few weeks ago came down with the stomach flu. 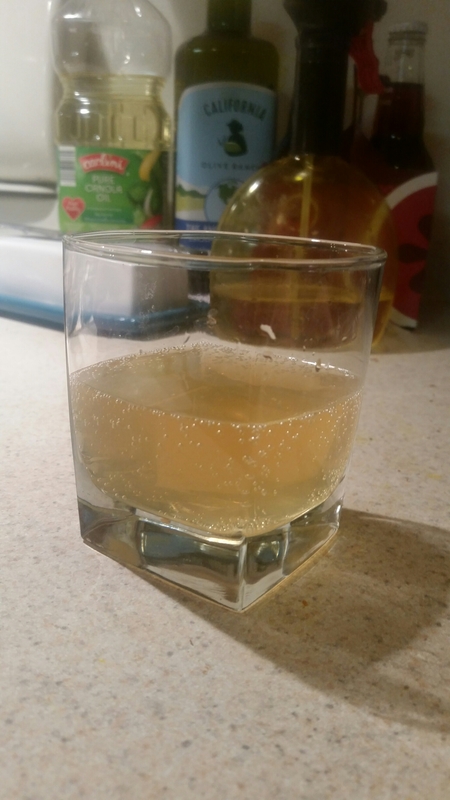 Now, he got pedialyte + apple juice, but mama was soothing the belly with some ginger ale! So, I finished off my trader joes bottle and decided to start in on the Aldi version. Let me tell you – if you miss the TJ bottle of this spicy and sparkly drink, you won’t be left wanting when you have the Aldi version. Trader Joe’s brew is a bit more up-front, and Aldi’s ale has a warming effect that comes in after a smoother entry than its competitor. I think anyone would be satisfied with the overall bite both of these bring. I can’t remember price points, but they were comparable for sure. So we’re the ingredienta, which were and probably are basically the same. I would guess, however, the versions of ginger used differed slightly since the mouth effect was different between the two. 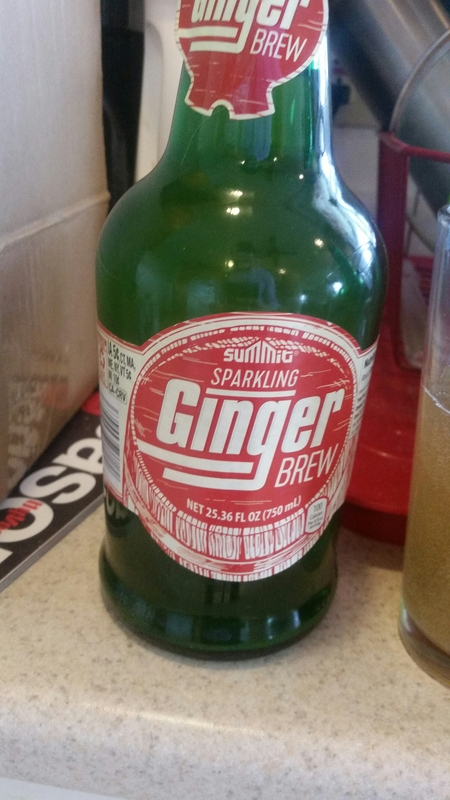 If you can’t get a nice mimosa on New Year’s Day like I probably won’t be able to, then hopefully take advantage of the fun experience this ginger ale brings! So, from this pregnant lady to all of you, I wish you a Merry Christmas, Happy Holidays, and a joyful New Year.I’ll see you in 2018! Aldi has a variety of baking spices out right now. What I didn’t realize, though, is that these things are seasonal to Aldi instead of being a mainstay like they are at other grocery stores. Who knew that ginger, nutmeg, and cloves weren’t needed with summer fruit pies? Oh wait – they are. These bottles of spices are about $1.70 where I’ve been shopping (I’ve been to 3 different Aldis this fall), and they are about 2.5 times the amount of the lowest-priced spices at Walmart and Target. For the same amount, based on those lower-priced spices, you are saving close to $0.65 per bottle. If you like baking like me, then that adds up! 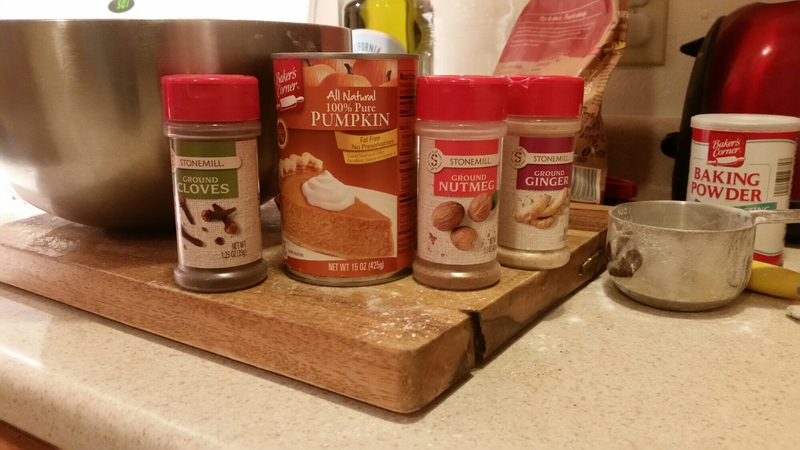 As you see there, too, the pumpkin and baking soda also came from Aldi. Both are fine quality and usually cost a good amount less than the big stores. But how does the flavor compare? With all the things above, I notice no difference between the Aldi brands and the others I’ve tried before. So I will keep buying these and stock up come spring. My peach crisp needs all of those spices and more (cinnamon!) to be what I want. P.s. Aldi also sells cinnamon (regular and organic) and allspice, but I have bulk cinnamon left over from our time in Pennsylvania and more allspice than I ever need from those off-season purchases. You can’t always get what you want, and sometimes you just want the real thing. If you are a classic siracha lover, Aldi’s brand of the ubquitously bright red, spicy condiment will leave you, well, wanting. It just doesn’t have the kick that the regular, rooster-clad sauce has. All that said, if you need something to kick up your stir-fry and can’t hustle over to another place before your meal, you could do a lot worse than this Aldi version. And perhaps you want something different for all your meals but don’t do well with too much heat. 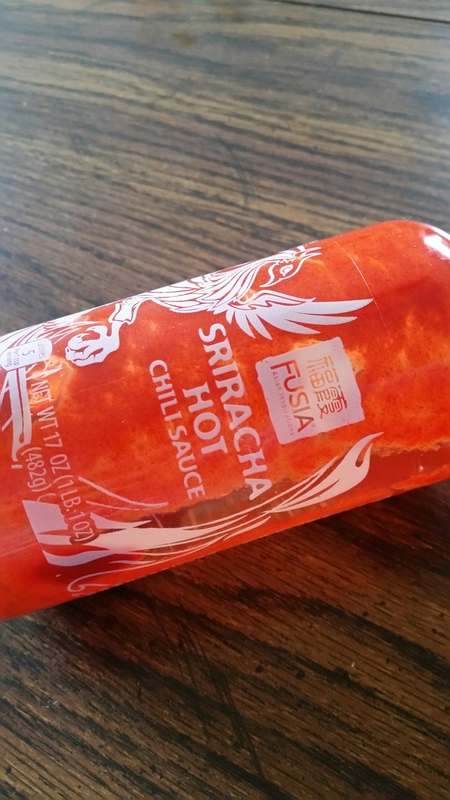 Aldi’s siracha would be a fine choice, then, if you want that compromise. Otherwise, save your pennies and pick some up on your next trip to wherever else. 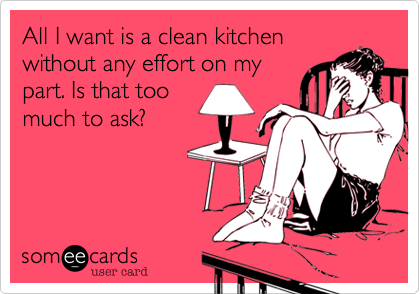 7 Ways to Declutter your Kitchen? I have two. I saw this post linked via the NY Times show up in one of my RSS feed subscriptions, and I burned a free NYT article this month just to kind of make fun of it. So here are my 2 ways to have a decluttered kitchen, though I will say the above link’s tips aren’t all that bad. Still, 2 is good enough. Shop at Aldi and get your staples only from there. Seriously – if there is just one kind of garbanzo bean, you’re less likely to, say, have 3 different cans in the back of your pantry because you couldn’t remember whether or not you picked the last can up at Walmart when you are perusing the legumes section of Target. Everything looks better when the sink is empty. Or you know what? Just turn off the kitchen light and forget the dishes are there. It doesn’t solve the clutter, but it does help you forget. And for the next 9 hours, your ignorance is your bliss….you know, until morning. Every single night – am I right? I’ve been impressed with Aldi’s selection of baking ingredients over the last few years. Organic sugars, pure cane sugar, pure vanilla extract, and all the other essentials and even many extras. Chia seeds? Ground flax seed? all organic? Yes, please! Dried fruit and nuts that don’t cost an arm and a leg? Thank you! I mean, they even have organic eggs. ORGANIC EGGS. Above are a couple of my favorites. I really like Morena cane sugar in place of regular white sugar. I feel a lot better about how it’s processed, and the flavor is great. I’d use regular white sugar again, but only if absolutely necessary. As long as I can get this at Aldi (so far I can – 3 different stores in 3 different states! ), then I’m good. I’ve made these cookies at least a few dozen times, and this is the best they’ve tasted! What you might not see here is the aromatic caramel taste that I have only achieved with this Aldi organic brown sugar. It’s delicious and really elevates your typical Tollhouse. Now, there is one major item missing from Aldi’s repertoire: whole wheat flour. With their movement to make everything more natural in their store, they have neglected to include this key ingredient in healthier baking. 4 or 5 different kinds of sugar, only one kind of flour. Also, I don’t do Aldi’s chocolate chips. If they have improved over the last few years, let me know. Their flavor just wasn’t chocolatey enough for me. There you have it – a quick appraisal of Aldi’s baking ingredients. You sure can make some show stoppers with what they have to offer. It’s worth the trip to save the $$$.